The difference between slow and plodding can be the difference between a slow but interesting story that gradually reaches a well-appreciated climax that rewards viewer’s for their patience. Where as plodding is something quite different. I would describe it as a narrative where nothing really happens and leads to ending that's neither exciting nor rewarding. 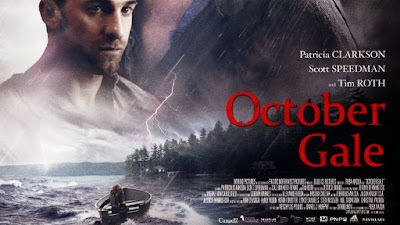 I would deem October Gale (2015) written and directed by Ruba Nadda, as plodding. Breaching the trades description act by calling it self a thriller is does boast a couple of well known actors including one of my favourite actresses Patricia Clarkson, British actor Tim Roth and London born Scott Speedman who I'm not quite so familiar with. Clarkson plays Helen Matthews whose husband died in a tragic boating accident one weekend while the pair was staying at their island holiday cottage. It's now been 12 months since her husband's death and Helen decides to return. Virtually cut of after her boat brakes down she spends her time clearing out ‘stuff’ that's not needed. During a night storm she hears noises and discovers a boat attached to her jetty, inside the craft are traces of blood. Returning to what she thinks is the safety of the cottage she finds a man (Speedman) laid out on the floor with a nasty bullet hole in his shoulder. Even Ms Clarkson can't save this tedious movie. We get flashbacks of her time at the retreat with her husband and also some idea of why her visitor ended up bleeding all over her carpet – yawn yawn! Even a belated appearance by Tim Roth, who can't save the tedium of the movies lame build up and its disappointing ending, who was much better in Michael Haneke’s US version of Funny Games (2007) which I think the director is trying to emulate - but without much success.